NOTE: Local MONDAY NIGHT FOOTBALL preemptions may affect ABC/NBC ratings in finals. CBS: THE NEIGHBORHOOD dropped 0.2 from last week’s premiere to 1.1, and HAPPY TOGETHER was down 0.1 to 0.9. MAGNUM PI held at 0.9, but BULL lost 0.1 to 0.7. FOX: THE RESIDENT (0.9) and 9-1-1 (1.4) were each down 0.1. 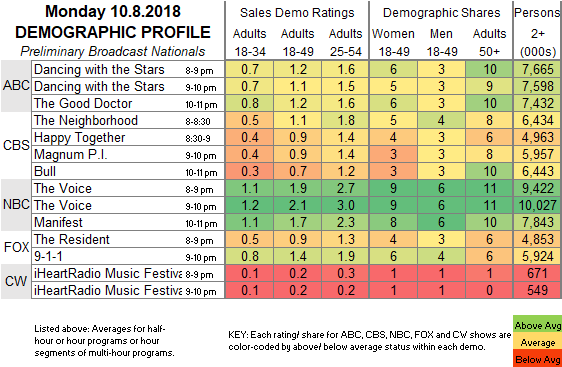 ABC: Currently, DANCING WITH THE STARS is up 0.3 to 1.1, and THE GOOD DOCTOR is up 0.1 to 1.2. 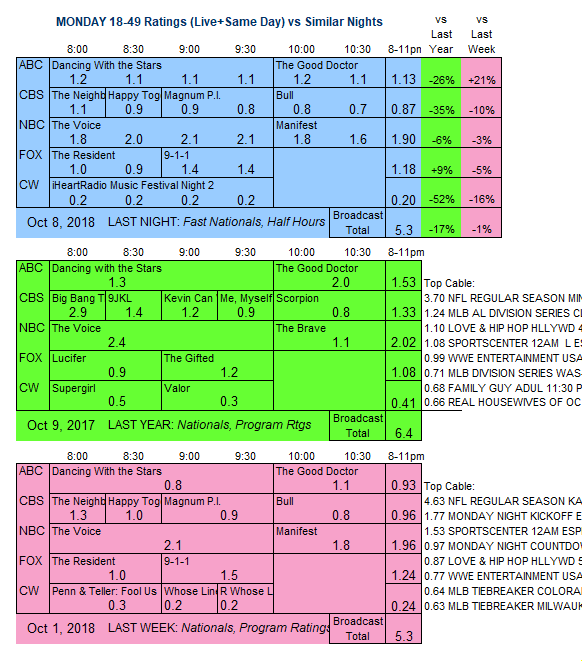 NBC: As of now, THE VOICE is down 0.1 to 2.0, and MANIFEST is down 0.1 to 1.7. CW: The 2nd half of the IHEARTRADIO MUSIC FESTIVAL special was at 0.2. ABC airs the AMERICAN MUSIC AWARDS tonight, and the CW fall schedule finally kicks in with season premieres of THE FLASH and BLACK LIGHTNING. In addition, the short run of FX’s late-night MR INBETWEEN reaches its season finale.